In the United States, the non-medical use of cannabis is decriminalized in 13 states (plus the U.S. Virgin Islands), and legalized in another 10 states (plus the District of Columbia and Northern Mariana Islands), as of November 2018. Decriminalization refers to a policy of reduced penalties for cannabis offenses, typically involving a civil penalty for possession of small amounts (similar to how a minor traffic violation is treated), instead of criminal prosecution or the threat of arrest. In jurisdictions without any penalties the policy is referred to as legalization, although the term decriminalization is sometimes broadly used for this purpose as well. After Nebraska decriminalized cannabis in 1978, no other state would follow for over two decades, until Nevada decriminalized in 2001. In subsequent years a number of major cities decriminalized cannabis or made enforcement of cannabis laws the lowest priority. Among the first major cities to pass such measures were Seattle (2003), Oakland (2004), Denver (2005), and San Francisco (2006). In the years that followed reform efforts continued to gain steam, with decriminalization laws passing in Massachusetts (2008), Connecticut (2011), Rhode Island (2012), Vermont (2013), the District of Columbia (2014), Maryland (2014), Missouri (2014), the U.S. Virgin Islands (2014), Delaware (2015), Illinois (2016), and New Hampshire (2017). 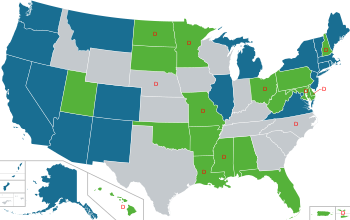 As of 2018 thirteen states have decriminalization policies in effect, and an additional eight states have decriminalized that later legalized. In 2012, success was finally achieved for legalization advocates in the states of Washington and Colorado, when voters approved Initiative 502 and Amendment 64. In subsequent years, cannabis was legalized by ballot measure in Oregon (2014), Alaska (2014), the District of Columbia (2014), California (2016), Nevada (2016), Maine (2016), Massachusetts (2016), and Michigan (2018), and by an act of legislature in Vermont (2018) and the Northern Mariana Islands (2018). In all of these jurisdictions, commercial distribution of cannabis has been legalized except for Vermont and the District of Columbia. 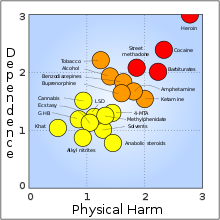 Personal cultivation is permitted in all, except Washington state. Public consumption and use by individuals under 21 are prohibited in all.